I admit it, I’m an enthusiastic person. I can’t help but function like a six year old when I get excited about something. You know, I jump up and down and wave my hands around and speak very loudly and animatedly about the thing of the moment–be it a book, a movie, a play, a character, an author, a story in my head, a celebrity, a friend, you name it–I can be the fanboy to end them all. Which means the last book I loved is always the last one I’ve read. I have torrid literary love affairs all the time. I get so into something I see my entire existence through the lens of that world. I try on characters like suits of clothing and walk around in them for a time. I map my own life onto the journeys the characters take. I talk about what I’m going through in my life by employing the metaphors used on the page. I don’t just read books, I live them. Like an actor in a role. Except I take on the entire story, not just one character. Most of the time, like an actor, when the story is over (or shortly thereafter) I will step outside of that world and go back to my everyday life. Aspects of a good book will stick with me like fog does as the sun comes out, lines of prose like wisps of smoke trailing behind, clinging to me, long after the rest has burned off. Pockets of inky text clinging to the low-lying areas–the shaded parts of my mind– where I can stumble across them at calm moments and remember that life I once lived. But once in a while there is a book I fall *in love* with. Those are the ones that even halfway through it is abundantly clear that the world I’ve entered is not one I will be willing to discard–not even parts of it–that this story is one that I need to actively incorporate into my life and my being, allowing it to reside in my imagination in perpetuity. Sometimes it’s a character I need inside me to become the person I want to be, others it’s the way a world was created that I’ve needed to understand how life is to be lived. Sometimes it’s the story itself that I require to pattern some aspect of my own journey upon. And rarely, it is more a function of how the story is being told and how that melds with the world of its telling that get me. One such as this will capture me and make me its creature–both the reader in me and the writer. It will burrow deep into my self–both selves, intertwined–and take root in my gut, incorporating my insides into its new growth, and blossoming into meaning and purpose and the drive to create. And if I’m lucky, later comes the fruit of a story of my own. Such a one is The Book of Flying by Keith Miller. The story looks simple enough–a young poet/librarian falls for a winged girl who won’t have him because he can’t know what it’s like to fly. And so, he heads off on a quest to acquire his wings. 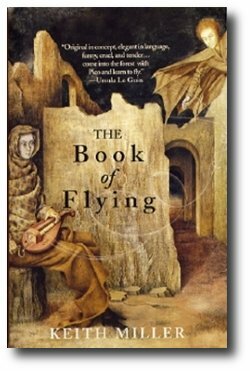 The epic journey to the legendary city in the east where the Book of Flying awaits is a varied one, full of new people, places, and stories, new ways of seeing, being, writing, dying. In short, revelations abound. Pico is gorgeous–familiar and flawed and working to incorporate into himself and his poetry all that he experiences–his companions are bright and bold and well drawn, each of them very different from the last. You feel as though you have lived many lifetimes with him in the course of his journey. The language is poetic and appropriate to the telling of a tale such as this, whether you want to call it a fairy tale, a fable, or a fantasy. But it’s not simply the language of the story in this book, it’s the language aboutthe stories and books encountered within that hooks into me and makes a home. I feel we’re all trying to find a story, like treasure buried beneath our city, and all the feeble stories we live are patterned after that pristine story whose shape we almost know. Sometimes just after I wake or before I make love I’ll think, This is the story, I’m living the story. But the world always rushes in with its clash and anguish. Stories are important in Pico’s world. And in all of the worlds he encounters and the lives he lives on his way. He comes from a place where people don’t read but succeeds in collecting at least one story from each person he encounters. Many of them acknowledge that telling their story brings meaning to their life. The time he spends in a rainy city full of books and readers and writers and artists becomes a formative one where he learns to love both a woman who is a writer of worlds made of language, as well as himself as a wordsmith. But let us not forget that our hero’s quest is to find a book. Not just any book. As it turns out, he finds The Book to end all books. Or, more accurately, The Book from which all books begin. Like in the quoted passage above, The Book is that pristine story. The one you have had glimpses of in every other book you’ve read. Those passages that transport you and then never leave–the fragments and glimpses of truth you carry with you through life–all of those gems are bits of The Book. It is a patchwork of all these bits and more, stitched together into a tale worth losing yourself in. A tale that transforms you as a chrysalis does a caterpillar, forever on a new level of being. I was unaware of how hard I believed in the existence of said book until I read the scene where Pico opens it. That is when I knew this book in my hand, The Book of Flying, by a man who must have seen deep inside my self at all the wisps and whispers I’ve ever collected, was the one which had a larger portion of The Book (or at least the one that I’m questing for) than any other story I had yet encountered. And yes, I’m prone to hyperbole. Yes, I use words like ‘best’ and ‘most’ and ‘perfect’ with abandon. In the heat of a good story I’ll say almost anything. (Flings are designed to be effusive.) However, it’s been more than a year now and I will tell you straight: I haven’t had this kind of experience–the one where words knife into the center of my being and take my breath away, leaving streaming eyes in their wake and my heart simultaneously full to overflowing and hollowed out with yearning–in a very long time. Not for myself as a reader–and writer, and lover of story–anyway. I’ve felt like that for a character, maybe, a narrator for sure. But to find myself coming across such truth about the word that began inside me, was reflecting my innermost writer-self onto the page, only to then shine back into my eyes as revelation? That was new. And I will be in love with this book until I die for the gift of that experience.